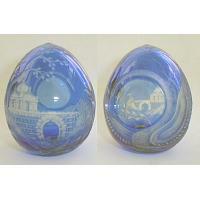 Authentic Russian crystal egg with exquisite hand-made glass engraving and 24 carat gold plating. Manufactured in St. Petersburg, Russia. Imported from Moscow, Russia.